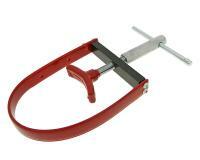 Universal locking tool for opening the clutch and convertor, as well as removing the flywheel. As there is not always a suitable tool for these jobs, and they quickly become troublesome, we offer this universal tool to make your life easier. The relevant part is braced and can be easily held in place and then loosened. The sling is fitted around the clutch bell or the flywheel in the scooter engine and then stops these from turning allowing for a quick and easy upgrade or repair. An essential must-have item for scooter dealers, scooter repair centers, and weekend race warriors looking for an excellent tool. Made by 101 Octane Scooter Replacement Parts. Available from Racing Planet USA.